Graph database vendors spend a lot of energy explaining how much faster graph technology is for running queries on connected data. But how much faster is it? The more connected your data is, and the more complex your query is, the faster graph technology is at processing your requests. The reason is that connected-data queries are based on relationships, which form natural paths through your data. 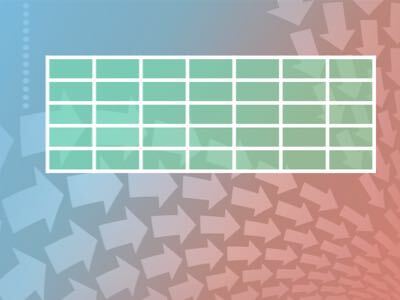 Relational databases convert these natural paths into unwieldy rows and columns of data, while graph databases preserve the data’s natural, path-oriented organization. When you query connected data in a Neo4j graph database, it traverses the paths through the data naturally and efficiently—because it follows the native organization of the data. The performance benefits of storing and accessing connected data with native graph technology is quite compelling. In their book Neo4j in Action, Partner and Vukotic summarize the details of a multi-level query benchmark they ran against a relational store and a Neo4j graph database. The query retrieved friends-of-friends in a social network to a depth of five levels. 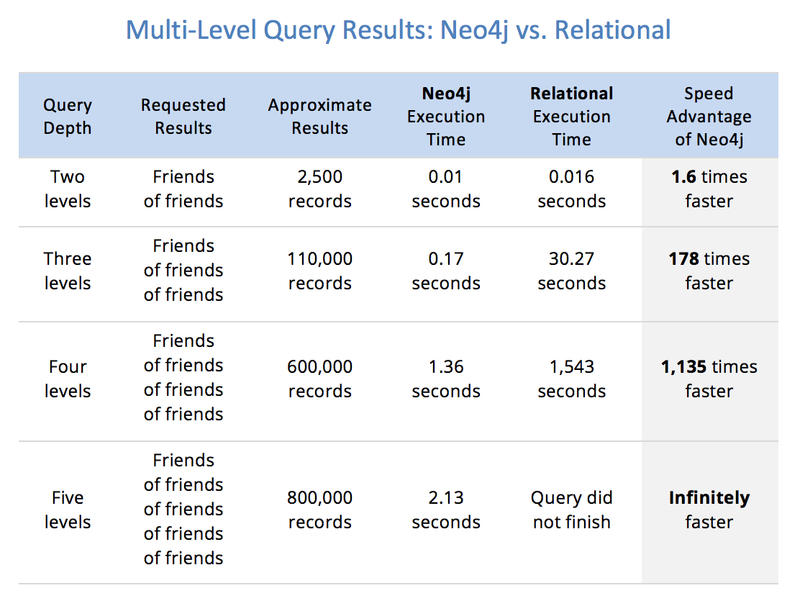 For a network of a million people, each with approximately 50 friends, the results show that Neo4j is a far superior database platform over relational for connected data. The above table shows how lackluster relational performance cripples applications that rely on connected datasets and multi-level queries. At two query levels deep, the relational system begins falling behind, and at three levels and beyond, its query speed is unacceptable, rising to a point where Neo4j runs more than a thousand times faster than the relational database. At five levels deep, the relational system does not even finish running the query and would apparently hang a real-world system. In contrast, Neo4j’s response time remains relatively flat for even the deepest queries: just a fraction of a second to perform the requests, and well within the responsiveness requirements for an online system. Which Applications Benefit Most from Graph Technology? The Neo4j graph database platform can be used for a wide variety of business applications, but there are many for which native graph technology is absolutely required to meet performance and reliability requirements. Some samples of those applications appear below.